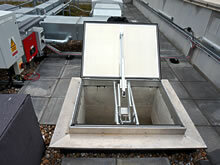 Mechanical smoke extract systems are often required where a natural ventilation solution is impracticable. One of the main benefits of a mechanical extract system is the possibility of estimating accurately its performance, as it will extract a certain volume of air in a consistent manner, and comply precisely with any given fire strategy. 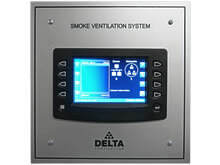 In addition, mechanical smoke shafts can often be utilised not only as a life safety system, but also as a dual function to allow common areas to be ventilated in day-to-day use. Depending on the scope of works, Delta are able to provide expert advice at the tender stage which can result in the most cost-effective solution, whilst ensuring all proposals comply with current industry standards and regulatory requirement. 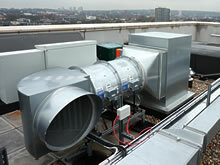 Smoke extract fan assemblies to suit duty required by the fire strategy. 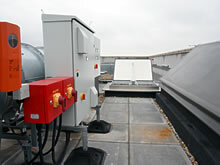 These include all mounting plates, fan ancillaries and ductwork if necessary. 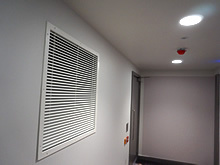 Smoke evacuation dampers for lobbies and corridors, including a range of termination grilles available in many colours and finishes. 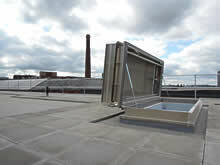 Weathered external ventilators, suitable for fan arrangements termination or head of stairwell mechanical ventilation. MCC Control panels, Automatic Transfer switches, HMI touchscreen panels and all associated control units to facilitate integration with BMS, fire alarms and manual override when necessary.